Since 1991, we've taken our job very seriously, by providing our customers help with effective service plans for their pest control needs. We are very proud of our accomplishments, and our many satisfied customers are proof that Safeguard has become the official pest control company in the Rio Grand Valley. We are not afraid of change, which is why we test the latest technology and use innovative products to help protect your home or Business. We continuously strive to perform our job with high moral and ethical standards. Great service, no complaints. Pablo is a very nice gentleman and explains and answers any question you have. Great Job. Safe Gaurd. Very satisfied with Safeguard , had my home serviced recently. Excellent employees very professional & respectful.Have use them for many years. I would highly recommend their service.Outstanding!! Great service! Mr.Millan was very professional answered any questions and concerns I had. First time getting pest control, very affordable and easy process. Jesus Millán was very attentive, answered any questions and concerns I had. Very professional. Very prompt! Excellent service!! Thank you!!! Job well done. Very courteous gentlemen n professional. Yes, thank you for the Safeguard service for the rotten feeding traps and sealing the (4) areas needed. Tony is a great representative for your company. We are happy with Pablos service so far. Hector Barrera, BA, USTC, VP-BD. We are Very pleased with the work done by Omar; very professional and thorough; he get's the job done the first time. Mr. Martinez provides good service and explains his results and gives you recommendations and immediate action toward fixing termite problem. Will recommend to friends in search of termite Inspector. Good and punctual service. Professional and courteous service. Pablo and Cesar were fantastic. Very professional and handled the job quickly and without any excess damage to my underside of my house. Have always appreciated the service. Mirtha A. Castellvi Bay M.D. Great service, have used Safeguard Pest Control for over 20 plus years. Employees are polite and understand to wait a little when we have patients. Always on time for the day scheduled for pest control treatment, and we have not had any problems with termites. All good. Thank you. Great service. did what they said they would do. went above and beyond the reasonable expectations. So far all looks good at the work done at my parents home. Service and service person Ramiro was excellent and thorough! Thank you!! Always patient & reliable service 😊. 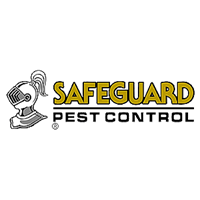 We’ve used Safeguard pest control for many years and we are very pleased with their service! Employees are professional and easy to get in contact with when we need them! Best pest control I have received. YOUR SERVIVE IS VERY SATISFACTORY. They have been very prompt and thorough.